Tyre Review is the best place on earth to get accurate tyre information straight from those putting them to the test. We have gathered reviews across Australia’s largest database of tyres and vehicles to help aid in the decision making of your next set of tyres. BFGoodrich tyre reviews are right here on Tyre Review! Known as one of Australia’s top off-road tyre manufacturers, Tyre Review have a heap of reviews for BFGoodrich. From terrain tyres, mud terrain tyres to their newer range of on-road tyres - read all the top reviews for BFGoodrich tread patterns including ALL TERRAIN T/A KO2, MUD TERRAIN T/A KM2 and ADVANTAGE T/A DRIVE. Continental tyre reviews can be found right here on Tyre Review! Known for their high performance range of tyres, Continental also have tyres to suit a wide range of makes from passenger vehicles to SUVs. Read reviews for Continental tyres top tread patterns, including ContiPremiumContact® 2, ContiEcoContact® 5 and ContiSportContact® 5. Tyre Review are your go-to destination for Cooper Tire tyre reviews! Thinking about purchasing a set of Cooper Tires, but want to learn more about them? We have reviews for Cooper Tires reliable and popular tyres suited to your 4x4, as well as other tread designs which are suited to most vehicles. Read reviews for Cooper Tire tread patterns including AT3, ST Maxx and CS5 GRAND TOURING. Get your Dunlop Tyre reviews hot and fresh here at Tyre Review! Considered to be one of Australia’s most reliable tyre brands, we have a heap of Dunlop Tyre reviews from across their range including popular tread patterns such as the Grandtrek AT22, Grandtrek AT20 and SP Sport LM704. When it comes to Falken tyre reviews, here at Tyre Review - we have your back. Peruse our collection of all the latest independent reviews on Falken tyres to learn more about their range of tyres, including popular tread designs such as the ZIEX ZE914 Eco Run, WILDPEAK AT3W and AZENIS FK510. General Tire tyre reviews can be found right here at Tyre Review! If you drive an SUV or 4x4, General Tire may be the manufacturer to do your research on, as they have a strong focus on SUV, 4x4 and off-road markets. Take a gander at General Tire reviews across their tyre range including Grabber® AT2, Grabber® AT3 and Grabber® X3. Goodyear tyre reviews are ready and waiting here for you at Tyre Review! One of the most distributed tyre brands in Australia - Goodyear tyres are readily recognised. See what others have to say about their experiences driving on a set of Goodyear tyres, including reviews on popular tread patterns such as the Assurance Triplemax, EFFICIENTGRIP SUV and Wrangler All Terrain Adventure. Get your GT Radial tyre reviews here at Tyre Review! Apparently these tyres can be found in more than 80 countries worldwide, though they aren’t as common here in Australia yet. All the more reason to read our reviews from across the GT Radial tyre range, including reviews on popular tread patterns such as the Adventuro AT3, Champiro FE1 and KargoMax ST6000. Get amongst Hankook tyre reviews here at Tyre Review! An emerging brand in Australia, Hankook cover tyres from the high performance category through to some serious off-road action stuff. Learn what others have to say about Hankook tyres in our collection of reviews, including reviews on popular tread patterns such as the Dynapro ATM, Dynapro MT and Optimo K415. Hey you - looking for reviews on Hifly tyres? Then look no further than Tyre Review! We have Hifly tyre reviews across their range of tyres, including popular tread patterns such as the HF805, AT601 and HT601. Step right up for Kumho tyre reviews here at Tyre Review! Kumho tyres can now be found in over 180 countries - so why not see what all the fuss is about? If you’re interested in tyre reviews for anything from a passenger vehicle to an SUV, 4x4 or commercial truck - Kumho may have the tyre to meet your needs. Read reviews for all the top Kumho tread patterns including MT51, AT51 and KL21. Did someone say Maxxis tyre reviews? Well, here at Tyre Review we have your Maxxis tyre reviews covered. Read reviews for tyres suited to passenger vehicles through to commercial trucks, including reviews for popular Maxxis tread patterns such as the AT980, AT700 and MT762 BIGHORN. You want Mazzini tyre reviews - we’ve got ‘em! Here at Tyre Review, we understand that you may well be looking for budget priced tyres that still offer quality. And that’s where Mazzini come in. Read Mazzini tyre reviews from across their range of all terrain, economy, highway, mud terrain and truck tyres, including reviews for popular tread patterns such as the ECO605, EcoSaver HT and ECO307. Get your Michelin tyre reviews right here on Tyre Review! Michelin are considered to be leaders in tyre innovation and sustainable development. See what others have to say about Michellin’s large range of tyres, including high-performance, SUV, passenger and 4x4 All-Terrain tyres. Tyre Review is here to share reviews on popular Michelin tread patterns, including PILOT SPORT 4, ENERGY XM2 and PILOT SUPER SPORT. Feast your eyes on Mickey Thompson tyre reviews right here on Tyre Review! With a strong racing heritage, they’re considered to be leaders in high performance 4x4 tyres for both the track and off-road. Their focus is on designing and producing innovative tread patterns and compounds. Don’t take our word for it - instead, read all the top independent reviews for Mickey Thompson tread patterns including Mickey All-Terrain 38, Baja ATZ P3 and Baja MTZ P3. Tyre Review has heaps of MOMO tyre reviews that you can read, right from the comfort of your own device! See what others have to say in our collection of independent MOMO tyre reviews, across their range of passenger car, SUV and commercial vehicle tyres, including reviews for MOMO’s top tread patterns such as the M-3 OUTRUN, M-2 OUTRUN and M-30 TOPRUN EUROPA. Nexen by YHI tyre reviews are on Tyre Review! Nexen are committed to producing and developing new ways to provide tyres that offer both value and performance, just as we here at Tyre Review are committed to providing you with independent Nexen tyre reviews! We have reviews spanning across their range, from passenger tyres through to SUV and light commercial truck tyres, including popular tread patterns such as the A/T PRO RA8, N'Fera SU1 and RO-HP. Get your Nitto tyre reviews here on Tyre Review! Nitto combine modern aesthetics with cutting edge technology to provide high quality and performance tyres for an array of vehicles from passenger cars through to 4x4s, SUVs and other light trucks. If you’ve been considering a set of Nitto tyres, why not peruse our collection of independent reviews for Nitto tyres, including popular tread designs such as the Terra Grappler G2® A/T, Trail Grappler® M/T and INVO®. OHTSU tyre reviews? Yep - we’ve got ‘em, right here on Tyre Review! Designed for optimum performance in both wet and dry conditions, OHTSU claim to offer road users with low noise, excellent tread life and even wear throughout the life of the tyre. But don’t take their word for it - see what others have to say in our collection of independent reviews across the OHTSU tyre range, including popular tread patterns such as the FP1000. Pirelli tyre reviews - lots of ‘em, here on Tyre Review! With a philosophy to pioneer innovation, Pirelli aim to stay ahead of the game, offering tyres across high-performance, ultra-performance, touring, cross-over and all-terrain categories. Read stacks of Pirelli tyre reviews from across their range, including popular tread patterns such as the P ZERO, Scorpion ATR and Cinturato P7. Searching for Sumitomo tyre reviews? Look no further! Tyre Review has Sumitomo tyre reviews which span across their range of passenger and light truck tyres, and includes reviews for popular tread patterns, such as the Tour+, HTR200 and HTR2000. Toyo tyre reviews for all here on Tyre Review! Toyo offer a premium selection of tyres for high-performance, family and luxury vehicles, 4WD, 4x4, SUVs, right through to light and heavy commercial trucks. If you want to know more about a Toyo tyre, chances are you can learn about it here at Tyre Review. We’ve got independent Toyo tyre reviews for all the top tread patterns, including Open Country A/T II, Open Country H/T and Open Country M/T. We have Vitora tyre reviews for you, right here on Tyre Review - to assist you with your tyre research and to make purchasing a new set of tyres that little bit easier for you. Vitora offer a wide range of passenger, performance, SUV, 4WD and light van tyres and here on Tyre Review, you can read independent tyre reviews from across the Vitora range, including Sportlife, Countrylife and Streetlife. XComp by Gladiator tyre reviews are available right here, right now on Tyre Review! XComp claim that their tyres are strong and durable, able to withstand the roughest of terrains. Perhaps you’re contemplating a set of XComp by Gladiator tyres for you SUV or 4x4 - well isn’t it fortunate that we just so happen to have a tidy collection of XComp by Gladiator tyre reviews, including tyre reviews for all the top tread patterns, including X-COMP MT and X-COMP AT. We have Yokohama tyre reviews for you here on Tyre Review for all your tyre research pleasures! Yokohama is currently the seventh largest tyre manufacturer in the world, claiming to offer good value, premium tyres. 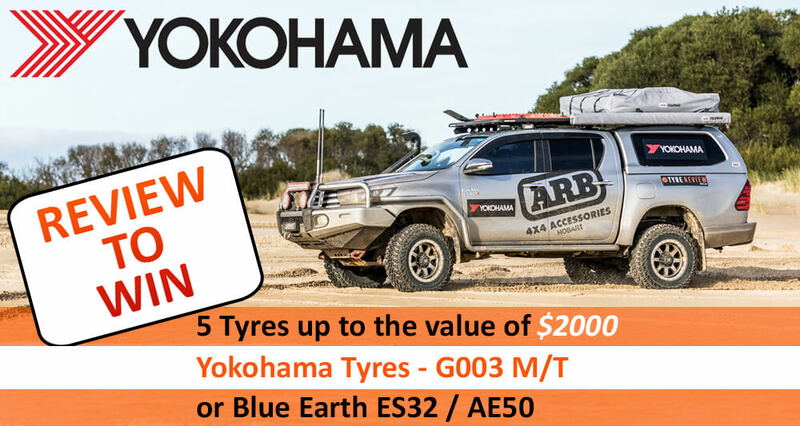 See what experiences other road users have had with their Yokohama tyres with Tyre Review’s collection of Yokohama tyre reviews for all the top tread patterns, including Geolandar A/T G015, Geolandar A/T-S G012 and Geolandar SUV HT G055.